Social exclusion is a broad term describing a continuum of inclusion/exclusion characterized by unequal access to resources, capabilities and rights. Social exclusion has been associated with reduced access to health care and worse outcomes. Currently, I work in one of the most socially deprived areas in Dublin, Ireland; a factor that ultimately affects our management of CKD. The patients that we come across have health outcomes determined from birth by their social circumstances. They live chaotic lives. Some are homeless. Many have co-existent substance misuse and mental health issues. In these circumstances, when a patient presents with kidney issues, diagnostic and therapeutic management can prove challenging. Biopsies are often avoided due to the risks involved- many patients will suffer from co-existent chronic liver disease. Therapy can be delayed or omitted due to concerns associated with compliance, follow up and toxicity. Outpatient appointments are made with the acceptance that sending out an appointment card to someone with no fixed abode is unlikely to be successful. 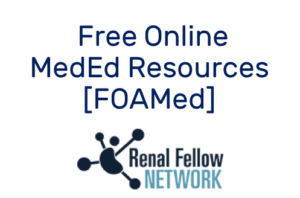 What are the factors contributing to negative kidney health in this group? 1. Low nephron number- The social, economic, and environmental circumstances that we are born into are formative towards our health. Our kidneys are not exempt, and are programmed in utero by our socioeconomic status. Low birth weight and IUGR occur with greater frequency in disadvantaged populations, potentially related to maternal malnutrition and hypertension. In a study comparing nephron number and glomerular size, infants with IUGR were found to have fewer nephrons, and greater evidence of glomerulomegaly compared to controls. 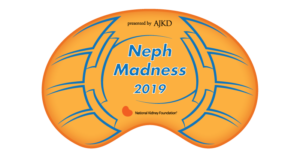 The association between reduced nephron mass, hyperfiltration, glomerulomegaly and later albuminuria, HTN and CKD, is well established. In a retrospective study of 918 CKD patients, socioeconomic status was inversely associated with heavy proteinuria on presentation, as well as rapid progression of CKD. 2. Substance misuse and the kidneys– What do kidneys look like on illicit drugs? Pretty varied. Cocaine remains the most convincingly nephrotoxic illicit drug, with multifactorial effects on the kidney due to changes in renal hemodynamics and glomerular matrix synthesis, degradation and oxidative stress, and induction of renal atherogenesis. Cocaine reduces catecholamine and norepinephrine reuptake, causing vasoconstriction of the smooth muscle. Classically, when examining the patient, ‘everything is up’ due to sympathetic overdrive, leading to HTN, tachycardia, agitation, and hyperthermia. Rhabdomyolysis tends to be the most common cause of AKI, but accelerated or malignant HTN can occur. Interestingly, findings of hypertensive-ischemic change, ie TMA can be present even in the absence of systemic hypertension. A few case reports of cocaine-associated renal infarcts exist, presumably related to thrombotic or embolic disease. The additives of the illicit drug are equally important. Cocaine induced vasculitis secondary to levamisole-adulterated cocaine use has become an emerging entity in the past number of years, characterized by a cutaneous necrotizing vasculitis affecting an ENT distribution, and dual MPO and PR3 positivity. Does heroin nephropathy exist? Whether morphine has independent effects on the kidney is debatable. Concomitant infectious process, HIV, HCV, HBV can all contribute to a spectrum of pathological changes seen in heroin users, such as FSGS in users of African descent and MPGN in whites. 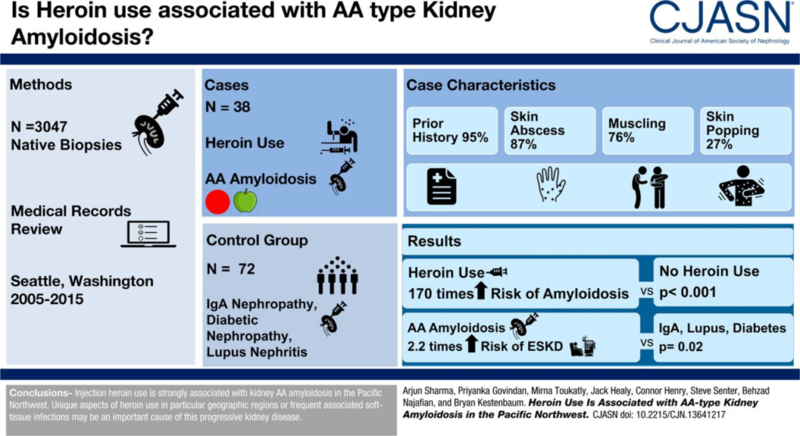 Renal AA amyloidosis, however, does appear to be more frequent in patients with intravenous drug abuse(IVDU). Autopsies performed on 150 drug users illustrated an incidence of approximately 5%, speculated to be related to chronic soft tissue sepsis associated with intravenous drug use and ‘skin popping’. What are the challenges that exist when a patient reaches ESKD? So, what happens when a person who misuses substances ends up on dialysis? Like everything in nephrology, the data is limited. According to the data that we do have, the outcomes are bleak. In a retrospective analysis of23 patients actively injecting drugs, the average life expectancy from the time of dialysis initiation was 8.6 months. The rate of late presentation (<90 days from presentation to RRT initiation) was high (65% versus 17.8% nationally), necessitating the use of catheter access. Formation of fistulas remained challenging. Critical care admissions occurred at a frequency of 0.42 admissions per patient-year. Competing interests, challenging behaviours, and non-adherence to a standard dialysis script/ schedule can impede effective dialysis in this cohort. The most common cause of morbidity, however, is related to the risk of inserting a central venous access into someone who intravenously uses drugs; blocked access and infections. No evidence exists comparing mortality between a person actively injecting drugs on dialysis, to one who converts to stable opioid replacement. Patients in a US haemodialysis population, with a history of illicit drug use, whether intravenous or oral, had a 2.8-fold higher hazard of mortality from potentially drug-sensitive diagnoses. The risk was higher in younger patients, < 40 years ago, and tapered off > 65 years. The authors postulated that the decreased risk with age progression related to remoteness of drug use, or survival bias. Studies on outcomes in transplanted patients with a history of drug use are lacking. Patients at the extremes of social deprivation present frequently to the emergency department, but are difficult to capture in the outpatient setting. In a study of moderate to severe CKD in the homeless, patients at risk of ESRD were easily identifiable by risk prediction models. Potential for intervention existed, if barriers to chronic disease care did not exist. Previous initiatives focusing on chronic disease management in marginalised populations have involved GP integrative care, outreach programmes, (@NephJC, Barbers and BP) and social housing. How can we implement flexible practices in order to prevent and treat CKD in the socially deprived? Many thanks to Cliona Ni Cheallaigh for her perspective.